Japan's Annual Antarctic Expedition Returns With 333 Whale Carcasses : The Two-Way The country's Fisheries Agency says the trip is conducted each year to further ecological research — which is an exception in a worldwide ban on commercial whaling. Others aren't buying the claim. 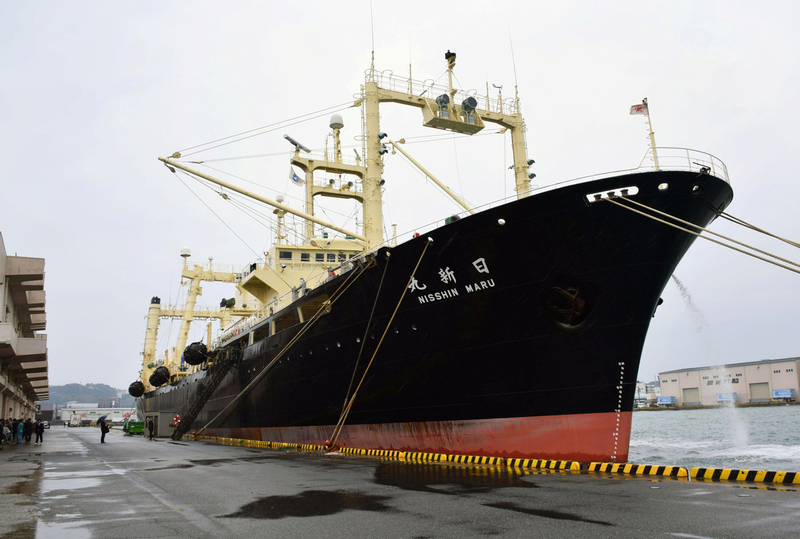 The Nisshin Maru, mother ship in the Japanese whaling fleet, returns to port in southwestern Japan on Friday. Under the rules of the International Whaling Commission, of which Japan is a member, there has been an international ban on commercial whaling since 1986 — though there is an exception for whaling conducted with ecological research in mind. It is this exception that allows Japan's whaling fleet to embark on its yearly hunt in the icy waters of Antarctica. Yet many critics view this use of the exception as a fig leaf, exploited by Japan's Fisheries Agency to cover for the practice of reportedly selling whale meat commercially. In fact, as NPR's Bill Chappell reported in 2014, the International Court of Justice ruled that the whaling program — which has been going on since 2005 and killed thousands of minke whales, according to the ICJ — has generated only limited scientific output. Not enough, in other words, to justify the program. Despite the ruling, and opposition from neighbors such as Australia, Japan refrained for just one year from killing whales on its annual expedition before returning to the practice under a document submitted to the ICW, which laid out the scope and techniques of its resumed program. "Japan will have to submit its proposed catch to a scientific working group within the IWC. "The commission will ask for further justification about why the scientific program needs to kill the whales to study them." For conservationists such as Humane Society International Executive Vice President Kitty Block, this change is not enough. "It is an obscene cruelty in the name of science that must end," she said in a statement, according to the AP.